This figure shows the simulated CIMR sea ice concentration field, using the Bristol algorithm as an example. The Bristol algorithm (Smith, 1996) combines brigthness temperature observations of the Ku (18.7 GHz) and Ka (36.5 GHz) channels. Simulated Bristol sea-ice concentration field at the resolution of CIMR (example from the Marginal Ice Zone). Below, the CIMR simulated sea-ice concentration is compared to that of past and current passive microwave satellite sensors including the Scanning Multichannel Microwave Radiometer (SMMR, 1978-1987), the Special Sensor Microwave/Imager (SSM/I and SSMIS, 1987 - today), and JAXA's AMSR2 (2012-today). The reference Marginal Ice Zone (MIZ) image is from Moderate-Resolution Imaging Spectroradiometer (MODIS). 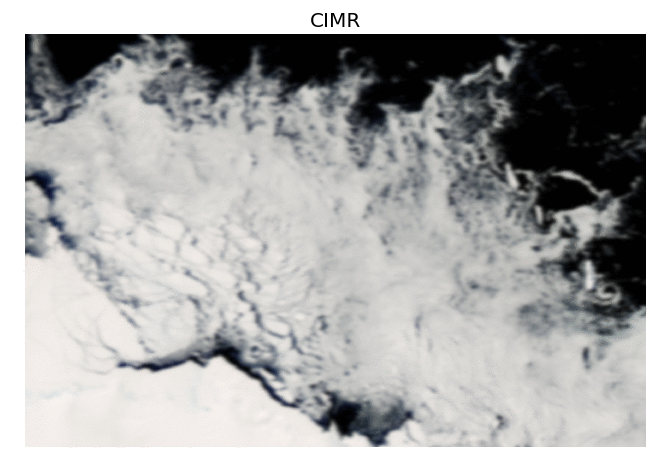 CIMR Bristol-based simulated sea-ice concentration fields, compared to those of SMMR, SSM/I, and AMSR2. Tonboe, R.: The Copernicus imaging microwave radiometer (CIMR) is a high priority Copernicus mission for evolving the Copernicus system, , doi:10.6084/m9.figshare.7751948.v2, 2019. Smith, D. M.: Extraction of winter total sea ice concentration in the Greenland and Barents Seas from SSM/I data, Int. J. Remote Sens., 17, 2625–2646, 1996.